We've been hit by a number of reports this morning that the Windows Phone Store is playing up and not allowing consumers to download apps and games. 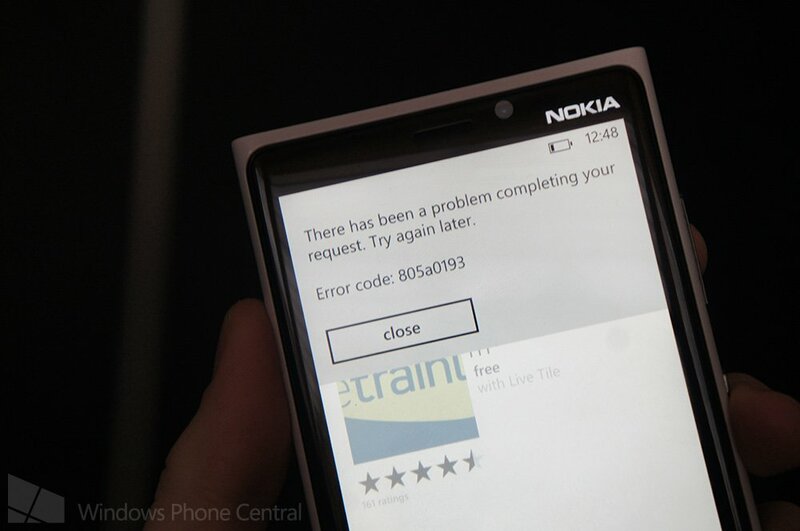 We're able to confirm that the issue is indeed present, with the error 805a0193 displaying when attempting to grab an app for our handset. This isn't the first (and probably not the last) time the store has fallen unwell. We'll be the first to agree with those who feel Microsoft should update error messages to detail exactly what the issue is, in favour of useless codes that may force one to search the cloud for answers. Here's hoping the company is well on its way to a working solution and everything should be back up soon. We've checked the Xbox LIVE status page, but there are no issues being reported with any service. Be sure to join in the conversation with other Windows phone owners over on our forms. Are you experiencing the same issue? Be sure to sound off in the comments. Thanks to everyone who tipped us!